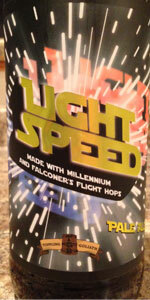 Previously known as Millennium Falcon, this seasonal pale ale was crafted with a perfect mixture of Millennium hops and Falconer’s Flight blend. Inviting orange aroma and hints of lemon flavor in this medium-bodied beauty will make you want to drink yours at light speed! Draft pour into a nonic glass at Red's Alehouse in North Liberty, IA. A: Hazy, medium golden color with one finger of diminishing white foam head. Moderate lacing remains on the glass. S: Rich hops combine grapefruit juice with ripening tropical fruit. Breadiness is scant, just barely detectable, nearly concealed by volatile hops qualities. Very clean. T: Begins nearly dry, with balanced toasty pale malt and assertive mixed citrus hop aromatics that demonstrate added brightness with the help of energetic citric acidity that fills the mouth. Hops flavors change in quality but not intensity during the middle, becoming more piney and herbaceous. The finish is comparatively mild, a little more earthy with a hint of spicy bitterness. M: Thin to medium viscosity, acidic on the palate, with low carbonation. D/O: This beer might as well be referred to as 'hop punch'--it exemplifies Toppling Goliath's mastery of applying hops flavors to pale ales. Unlike the few others encountered, this pale ale showcases qualities that appear more mainstream than experimental (although there has to be a certain experimental spirit at work any time dry-hopping of this magnitude is performed in a commercial setting.) Top-shelf all the way, save for looks; on the order of Alpine Hoppy Birthday or Strand 24th Street. Hazy and bright orange/gold beer with a foamy white head. Smells super fruity with oranges and some piney hops accentuated with some malty sweetness. Tastes a lot like sweet orange juice with a great bitter hop finish. Really nice and delicious pale ale. Big thanks to mase32 (Reddit) for this beer, first bottle leaked quite a bit so he even sent a new bottle to replace it. Awesome trader! Shared this with rudzud and threelions. Hazy carrot orange color, decent creamy fizzy head. Nose brings great fresh hops, tropical notes, papaya, citrus, pineapple, juicy creamy orange, faint resin and nice floral aroma, little pith and rind, faint mango. Taste more fresh hops, tropical notes, papaya, mild mango, little bitter rind and pith, nice juicy citrus tropical notes, mild resin and fluffy creamy malts, nice bitterness and juicy malts. Nice balance. Finish dry nice mild bitterness, juicy tropical notes and faint resin and pith lingering. Mouth is med bod soft feel and nice carbonation. Overall quite nice, delicious great hops, definitely crushable as well but so good you want to savor it. Wish I could get more of this. Bomber. Cloudy orange, great head retention with tons of lace. Citrus peel smell with a little bready goodness. Taste is great balance of juicy citrusy hops and grain. The citrus remains throughout into semi-dry finish. Has that soft TG mouthfeel. Overall delicious pale ale! Thanks Kegatron for sharing this one with us. Poured from a bomber into a snifter. The brew appears a hazy golden copper color with sudsy white froth that holds well. The smell is grassy, herbal, and citrusy with a bit of pith and pulpy character. The taste is grassy and herbal with the previously mentioned pith and pulp-like bitterness. This is a light bodied brew, pretty crushable with moderate amount of carbonation. If this was readily available id consume mass amounts while doing yardwork. BOTTLE: 1 pint 6 fl oz brown glass. Flashy label. Unbranded gold colour pry-off pressure cap. Huge thanks to Duff27 for the bottle. Huge thanks to Collins for the share. Expectations are high given Collins recommendation. Expectations are sky high given the brewery's reputation. Huge thanks to Duff27 for the bottle. Served cold into a tulip at low altitude in Austin, TX and allowed to warm over the course of consumption. HEAD: White head dissipates within 15 seconds, leaving no lacing. BODY: Pretty standard copper with orange hues. Translucent. Nontransparent. Clean; no yeast particulate or hop sediment is visible. Appears well-carbonated. Not unique or special looking. AROMA: Resinous, floral hop character, pale malts, and some interesting oniony notes. Not piney, fruity, or juicy. No yeast character, alcohol, spice, or off-notes are detectable. Aromatic intensity is moderate. I'm not sure I really like the hop profile. TASTE: Oniony, yes, but it kind of works. Has some floral hop character, but no juicy fruit, pine, or citrus. Not nectary. Pale malts provide the backbone. There's zero hop bitterness whatsoever, but while it's balanced in the sense that the malt sweetness checks the hop bitterness, the dominant oniony character isn't the right emphasis for a pale ale. Above average depth of flavour. Average duration and intensity of flavour. This flavour profile is simple, but effective. Still, it lacks the intricacy/complexity and subtlety of superior beers in the style. I do like it, but I can't saw I'm blown away. TEXTURE: Smooth, wet, fairly refreshing, medium-bodied. Mild thickness. Slightly overcarbonated, but not too crisp or sharp. This texture fails to elevate the beer, but does suit the taste nicely. Should be softer. OVERALL: Very drinkable, but not effortlessly so like the best beers in the style. It's nice work from Toppling Goliath, but isn't world-class. I'd probably buy it again if I saw it on shelves. A solid pale ale for its aims, but the onion emphasis does put me off a bit. pours a glowing amber with a big 2 finger eggshell head that sticks around for a while, and leaves good lacing. Big and interesting but not overpowering nose...at first I think mango and pine, but then it starts to lighten up, and there is some flowery lemon blossom and the citrus is more like orange than mango...good stuff. Taste follows the nose, though isn't quite as much fun...there's some zesty tingling of the tongue and it finishes with some nice bitterness, but for the most part it is smooth, creamy and fairly substantial in feel without being heavy, with slightly low carbonation that works nicely for me.